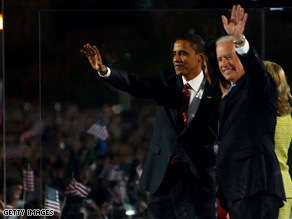 Barack Obama and Joe Biden announced their transition team Wednesday. (CNN) - Barack Obama and Joe Biden formally announced their transition team Wednesday, and named former Clinton chief of staff John Podesta, longtime Obama advisor Valerie Jarrett, and Pete Rouse, Obama's Senate chief of staff, to oversee the operation. Chicago – For the past several months, a board of advisors has been informally planning for a possible presidential transition. Among the many projects undertaken by the transition board have been detailed analyses of previous transition efforts, policy statements made during the campaign, and the workings of federal government agencies, and priority positions that must be filled by the incoming administration. With Barack Obama and Joe Biden's election, this planning process will be now be formally organized as the Obama-Biden Transition Project, a 501(c)(4) organization to ensure a smooth transition from one administration to the next. The work of this entity will be overseen by three co-chairs: John Podesta, Valerie Jarrett, and Pete Rouse. The co-chairs will be assisted by an advisory board comprised of individuals with significant private and public sector experience: Carol Browner, William Daley, Christopher Edley, Michael Froman, Julius Genachowski, Donald Gips, Governor Janet Napolitano, Federico Peña, Susan Rice, Sonal Shah, Mark Gitenstein, and Ted Kaufman. Gitenstein and Kaufman will serve as co-chairs of Vice President-elect Biden's transition team. Barack Obama has declared that there is not Red America, or a Blue America, but rather a United States of America. Last night he spoke to the supporters of John McCain, saying, "I need you help", and that "I will be your President too". Now, if you're a conservative, you can choose to be cynical and believe that this is nothing more than political rhetoric- but you'd better hope that it's not, because if it is, then we're all screwed for another four years. You can also be selfish- we can all be selfish, we can all cling to our sense of exclusive identity and go on hating each other until the entire country falls down around our ears. You can laugh at Obama's calls for unity because you're a small-town pro-lifer who thinks that he's godless and arrogant, and continue to hate all the "blue states", and I can respond by continuing to hate the "red states" and thinking of you as nothing more than a fat, lazy ignorant person. We can literally do this until the country dies. And it would be the dumbest, most selfish thing to do ever. We have issues in this country, and this is the time to focus on them. Barack Obama is not a Muslim (though it wouldn't matter is he was), he is not a terrorist, he is not a communist. I like him because he transcends the Cold War- he's said the things that nobody else has had the courage to say because we like to break things into "Communist" and "Democratic"- a totally false and outdated distinction. Obama believes that government should find where it can do the most good to help its citizens and the world, do what it can there, and back off where it's less effective. In that sense he's very pragmatic- and pragmatism is what we need. We need a realistic solution to Iraq, a realistic solution to the energy crisis, a realistic solution to health care and global warming and a realistic way to improve education across the board. We need to work together to do it. So please, everybody, the Republicans are not Nazis and the Democrats are not communists- it's incredibly obvious if you just take 3 minutes to use your brain instead of just making up hateful things about people who aren't just like you. I understand your anger and sadness that McCain was not elected. I voted for him, after months of debating everything that both candidates had to offer. Doing research outside of what the media offered and trying hard to stay open minded toward both sides. It was not an easy task and I made my decision with a very heavy heart and conscious. The election is over now that and we must work together. This country is not in a good place right now and it's citizens have a lot of hardships in front of them. Regardless of who you voted for, we all need to stand up and make things happen in a postive way now. We need to get up, use American drive and ingenuity, and make good things happen for the country. Spitting anger and venom on blogs, and bottling yourself off because you don't like something is a childish act that drags this country down further. If you don't believe in something our government is actually doing, then get out there and try to make a positive difference. Try to inform people, educate them and yourself, while trying to make a change in a positive way. Don't just throw stones from a distance or attack people when they don't see your view on something. You may educate people on some things as well as see some things in ways you never saw before, causing you to understand things in a different or more detailed way. Causing yourself and others to come together in a way that's fair, fitting, and valuable to everyone.